In the middle of bustling W.V.S. Tubman High School in Monrovia, Liberia, you’ll find a tranquil two-room oasis: the mental health clinic. Behind its metal door, which blocks out much of the cacophony from the open-air halls, students talk to mental health clinician Leah D.T. Sorboh about problems major and minor. Some of the teens’ complaints echo those of their counterparts around the world – they talk about breakups and mean teachers and difficult tests. Others speak of things no child should experience – horror stories of physical and sexual abuse, of living as an orphan after watching their parents die from Ebola. “Sometimes I feel very terrible because of the things they have suffered,” Sorboh said. These terrible things are what motivated The Carter Center, which was already training mental health clinicians in Liberia, to start a new training program to build a cadre of child and adolescent mental health clinicians. So far, The Carter Center has trained more than 80 child and adolescent mental health clinicians; Sorboh was part of the first class. The mental health clinic is a small but welcoming spot at W.V.S. Tubman High School. Despite the challenges, she loves her role. She sees an average of about 10 patients a day – some for one-off sessions, others on an ongoing basis. Typically, students come to her after first visiting the school’s guidance counselor, who refers students she thinks will benefit from mental health services. Students then see a registered nurse to make sure they don’t have physical ailments that need attention. After that, Sorboh performs a psychosocial assessment. Oretha K. Domah was Tubman High School’s guidance counselor until a recent promotion sent her to the district’s central office. She said having a mental health clinician on-site has improved life for many students. Unless a student has epilepsy, Sorboh doesn’t dispense drugs. Instead, she focuses on therapy. If drugs are needed, she refers patients to someone else. Some of her more difficult cases involve students with post-traumatic stress disorder. 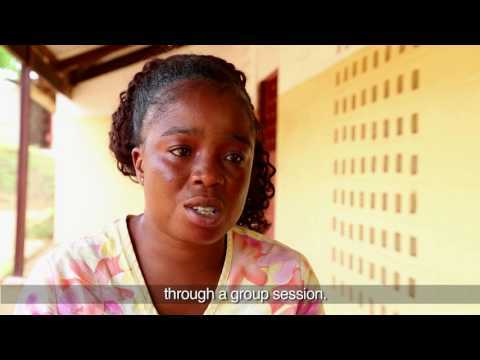 She works with a student who lost both parents to Ebola, another who was raped by a relative, and still another who survived a serious car accident and is re-traumatized every time she passes the scene of an accident. With them, she has used play therapy, asking them to dramatize and act out what’s happened to them so that the experiences will eventually lose some of their power. Sorboh deals with a lot of family drama has well. One student, for example, was having trouble getting along with his siblings. She managed to get all the siblings to come in for some sessions. One of their parents recently called to thank her, saying they were getting along much better. Parents play a crucial role in Sorboh’s work. Liberian culture has typically favored a harsh form of parenting, she said, which can exacerbate problems. That’s why Sorboh has started school-based and community-based groups that meet regularly to discuss issues related to mental health. Sonnie Fatormah and Regina Jah, who both have multiple children at Tubman and regularly attend the group meetings for parents, said they are grateful to have a trained professional there to help students. “Our children, sometimes they come to school with heart heavy,” Jah said. Suzan O. Karnuah says talking with Sorboh about her problems at home or school makes it easier for her to concentrate in class. Students give Sorboh high marks as well. Suzan O. Karnuah, a 19-year-old junior who would like to be a petroleum engineer someday, says meeting with Sorboh has been a great help. She has talked to the mental health clinician about problems at home, and afterward, she says, she generally feels relieved.